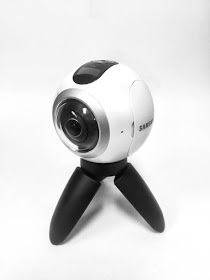 One of the interesting things about the Samsung Gear 360 (reviewed here) is its excellent audio. It can capture even loud sounds without buzzing, it seems to be able to reduce wind noise, and best of all, the sound is 360-degrees when viewed on the Samsung Gear VR (reviewed here). Yesterday I found out just how good the Samsung Gear 360’s audio is. My friend David Grass recorded a wedding reception with his Samsung Gear 360, including the dance, then he uploaded the video. To his surprise, his video was flagged for a copyright violation! Apparently, YouTube employs automatic algorithms for detecting when copyrighted video or audio is put in a video file. In this case, YouTube’s computers thought that he used a copyrighted soundtrack, when in fact he was just recording the ambient audio from the dance! (Fortunately when he uploaded a shorter version of the video, he wasn’t flagged anymore – probably as fair use). Anyway, here is a short video I took recently at a live summer concert at the local park, so you can listen for yourself (note: it was also breezy – you can hear a little bit of the wind). Good news! Insta360 Nano shipping earlier than expected!